Abby's mini gallery wall is one of my favorite little spots in her room. It's also one of Abby's because every morning with my heated coffee mug in hand, she points her cubby little finger to the wall and say's, "babies, babies!" Even randomly through out the day she talks about these photos. In the beginning, this project was a bit of a challenging because so many examples on Pinterest were either too large in scale or too busy. 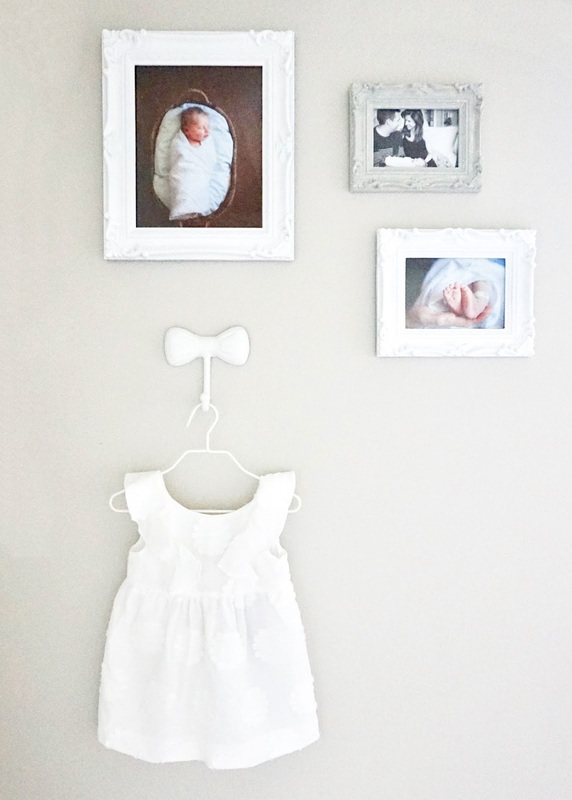 I like the look of clean line(s), soft color's and an overall classic style for a nursery. Along with a touch of feminine for Abby. So I thought I'd share below exactly how I put this mini gallery together for anyone else out there who also doesn't have a huge wall space though wants to create one too. 2. Lay everything out on the floor first. Photo/design side up. 3. Start with the largest piece and work your way around it. 4. Take a photo on your cell phone of your top 3-5 favorite arrangements. 5. Step back and hold your cell phone up to the wall. This help's you really envision the final product. 6. Think about your expectations for the space. I used damage-free hanging strips for future rearrangements in her room. If you're interested in the frames I put up in Abby's room I purchased them from Amazon and you can find them here and the bow hook here. I spray painted the smallest frame light gray and the bow hook white. I hope all of you have a wonderful Easter weekend! Over here, we are certainly getting excited to watch Abby hunt for sticker filled eggs on Sunday! At 22 months, I realize Abby isn't quite old enough yet to dye Easter eggs with me, swap and share all the pink jelly beans, or munch on PEEP marshmallows (actually these last two could be a good thing! ), so I decided to get creative when it came to the traditional Easter celebrations, by making them as toddler friendly as possible. So here what's in her basket this year. I ordered this one with the intention that she'll use it year after year until she hits middle school (yes, I still plan on doing Easter baskets then because I'm THAT kind of mom and proud of it!). I plan to remove the bunny ear liners as she gets older. Instead of dying eggs, I chose to cut around these fun little stickers and place them inside these pink eggs. 22 month old Abby LOVES stickers. So I thought this would be a great way to make the traditional Easter egg hunt toddler friendly. I don't know which one I'm excited for more, seeing Steve hide the eggs or watching Abby find them? We've really been into felt play food for Abby lately since she loves being in her play kitchen. Abby "cooks" in it almost every day, and Steve and I are beyond satisfied that she's enjoying our little DIY project. I recently spotted these darling felt donuts, fruits and veggies during our errands this last week. Into the Easter basket they go! I'm sure you've seen Abby's love for accessories on Instagram. “Sunnies” are her latest obsession. When she started to put them on all her stuffed animals, I knew another pair was certainly going to go in her basket. 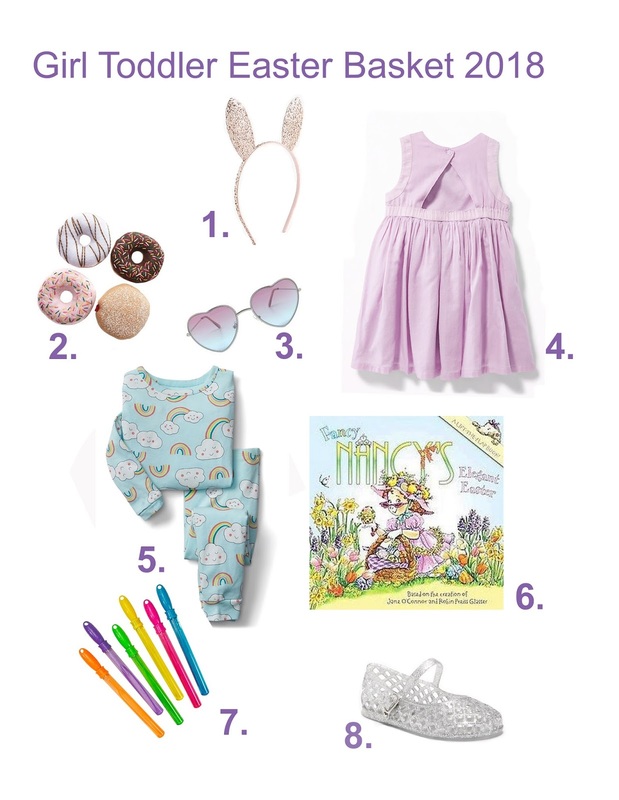 I was so excited to find these purple sunnies since they match perfectly to her Easter dress. For the second year in a row, I've purchased an Easter dress that can be either dressed up or played down. It's what I like to think of as, a "spring-into-summer" outfit since Abby gets to wear it more than once. I love the flow of the fabric for the purple dress I got her here. The cute cut out in the back is what really made me place it into my cart. I can't seem to help myself each holiday by gifting Abby something practical, like jammies. She wears a pair each night, so when I think of it this way, having at least 4-5 pairs on hand to rotate through each week with our laundry feels smart. Plus, these rainbows jammies here were just too cute to pass up for spring. There are so many good books out there, and it's been really fun the last 1.5 years to add onto our collection including our favorite series, Fancy Nancy. Steve and I prefer reading this series over a lot of her other since they are beautifully written and educational. We like Fancy Nancy becuase it helps Abby learn challenging words through cute stories and vivid illustrations. I highly recommend this series if you have a little girl. For Easter, Abby is getting this one. Maybe it's an 80's/90's mom thing, although getting my daughter a pair for $8! and reliving my own favorite childhood shoes is really fun. Every time I hear Abby say, "jelly shoes, jelly shoes!" my mama heart soars. So these jellies are going in her Easter basket. I love that as moms of toddlers we can still celebrate just as much with them as if they were six years old by getting a little creative. After we had one too many pieces of cake in our belly and over 90+ hugs from family, the women in my life and I sat down to talk about motherhood. 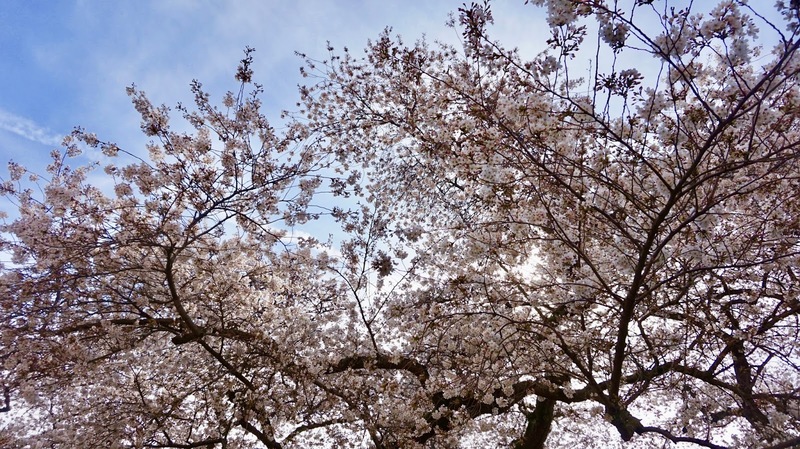 Three generations of wisdom wrapped up in one blog post! Below is what I've learned. Time, and how we use it, has become much more valuable to me since I became a mom. And, after, talking to the special women in my life, I learned that the value we place on time as mothers will evolve again in the future and mostly like twice, if not three or four more times. 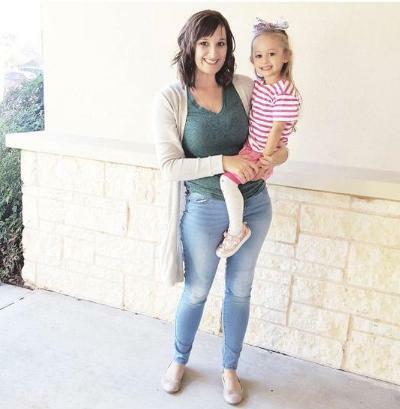 Although I can't predict the future anymore than I can predict how I'll feel about it, below is what I've learned this week about being a mom from pre-motherhood, to early motherhood, and even to great grandmother-hood years. Sleep: Sleeping in on weekends refreshes you. You can even squeeze in a nap during those college years. Family: The constant, most important part of your life (even if it's subconsciously). They are eager to hear how your life is going, friends, graduation, job hunting, career, dating, wedding planning etc. They call just to "check in" or send cards and care packages. You may even be asked to go on vacation with them! Sleep: Constantly question yourself if you'll ever feel "rested and refreshed again." Sleep interuptions become your new normal. Coffee: Getting any kind of coffee (hot or cold) in your hands is your first thought of the day. Sleep: You're sleeping through night, alhough you are able to get by on less sleep because you have a circus to run the next day. Your kids' sleep patterns become your sleep patterns. Coffee: Saturdays and Sundays you go for coffee with the "girls." Family: The most constant important thing in your life. Your kids' emotional well-being is your first priority and your main worry. You also become a taxi driver and coordinator of everyones activities and plans. Sleep: You can get by on less sleep. But when you do sleep, you sleep like a baby. Coffee: Sipping coffee in the morning with your significant other while reading in your bathrobe and slippers. Family: The most constant and important thing in your life. This is almost more fun than having your kids because you get to do the fun things and then pass them back to the parents and go home and sleep! Sleep: You can sleep whenever and however long you want. Coffee: This is no longer needed. You can nap anytime of the day! Family: The most constant and important thing in your life. You LOVE it when they visit, send cards and throw you an awesome 90th Birthday party for all your friends (everyone in the retirement community) to attend! Hugs from family are gold. Time to feel and hear bubble wrap "pop"
Time to watch them learn new skills. On Instagram, we all joke about being tired, needing coffee, wine, trips to Target and wanting time to ourselves once in a while. I'm so guilty of all the above! We do need all of these things as mothers! I also realized on Sunday that this part of my life, although it requires constant care and attention to be in the early stages of motherhood, it is only 1/5 of my entire lifetime. When I look at it this way, I realize time is a thief, and, if I let it, I'll miss out on all the things time does allow me to have with my baby/toddler. These are the days, mamas, and this is the time most of have dreamed about since we were 5! I hope this post help's you reflect on how you want to spend your "early motherhood" days as this week has certainly put things into perspective for myself. I am Kelly Mock, and I blog over at Happilyevermock.com I'm a momma to 3 1/2 year old Hallie. My husband Christopher owns a franchise custom T-shirt shop, and I run the social media accounts for his shop! We have a 8 year old Mini Aussie Puppy named Stella, she was our first baby, and very loved! 1) Why did you start your mom blog? I wanted a place to document Hallie growing up. To be able to save photos and memories. To write about the funny things she says and does so that we can look back on it together one day! One thing I didn't expect was meeting such an incredible group of fellow moms here in cyberland that I feel so connected to! I have watched so many families grow and change over the last 3 1/2 years and it has been such an incredible experience! If you are thinking about starting a blog, do it! You wont regret it! 2) Exciting up coming plans for you? And or your family? I love this question! I'm super excited because Easter weekend my Dad is getting married to the most incredible woman! I am just so happy for my Dad and thrilled to welcome Linda into our family. Not to mention her precious kids and grandbaby! Hallie is going to be their flower girl and she's pretty excited too! 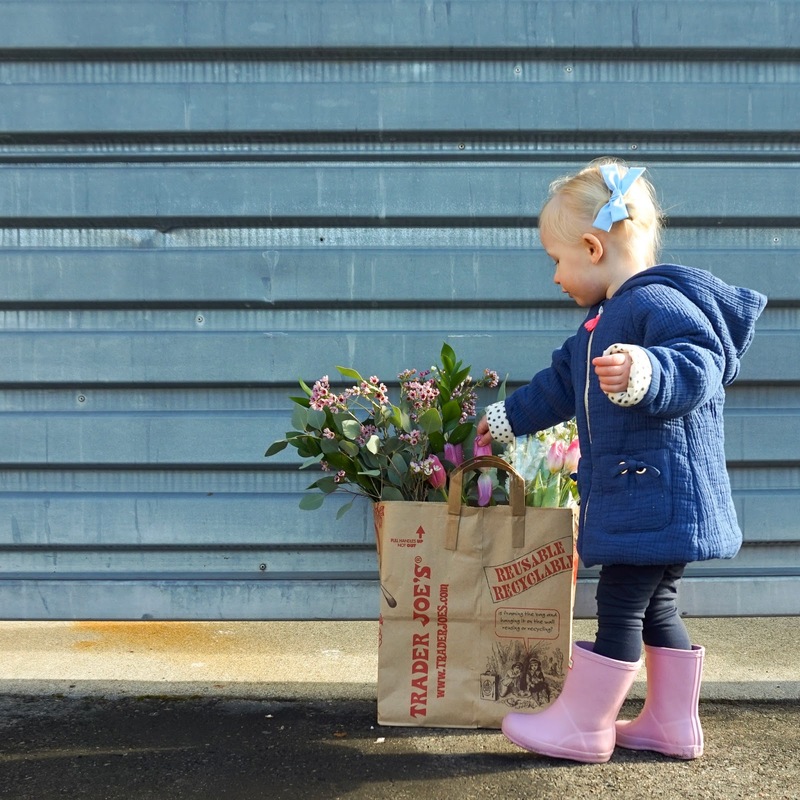 She has been practicing dancing around with her basket and throwing invisible flowers, it's just the cutest! 3) What do you wish you knew about motherhood before becoming a mom? I wish I knew how much having a child would change all the other relationships in my life. Not that my husband, my family or my friends are less important to me now. That's not it at all. But having a child is so time consuming, that I need to remember to make time for the other important people in my life. Lunch with the girls, date night with the hubby or brunch with my dad. Taking the effort to plan these things is so important. 4) What is your most embarrassing motherhood moment to date? Ugh I can't believe I'm about to share this, and to make it a little less embarrassing I'm going to have to do it without naming any names! It's an embarrassing secret I've been keeping since Hallie was a baby! So before Hallie turned one, we were driving to an event with a family member. Said family member was inside a store and I decided to take that moment to change Hallie's diaper. Hallie had a serious constipation problem as a baby, so I wasn't expecting a dirty diaper. I had her laying on the seat of the car on the changing insert from the diaper bag. What could go wrong right? Well as I opened the diaper a small pellet of poop rolled out of the diaper, onto the seat of the car, and in a little crevasse between the seat belts. Mortified and noticing the family member walking out of the store and into the parking lot, I freaked out and spent what seemed like an eternity digging for the poop pellet with a baby wipe! Seriously in the nick of time I was able to grab it and shove it into the diaper like nothing happened and finished changing the diaper! Of course I am sure this family member was unsure why it took me so long to change a diaper, but thankfully they didn't say anything, and it has been mine and Hallie's secret ever since! 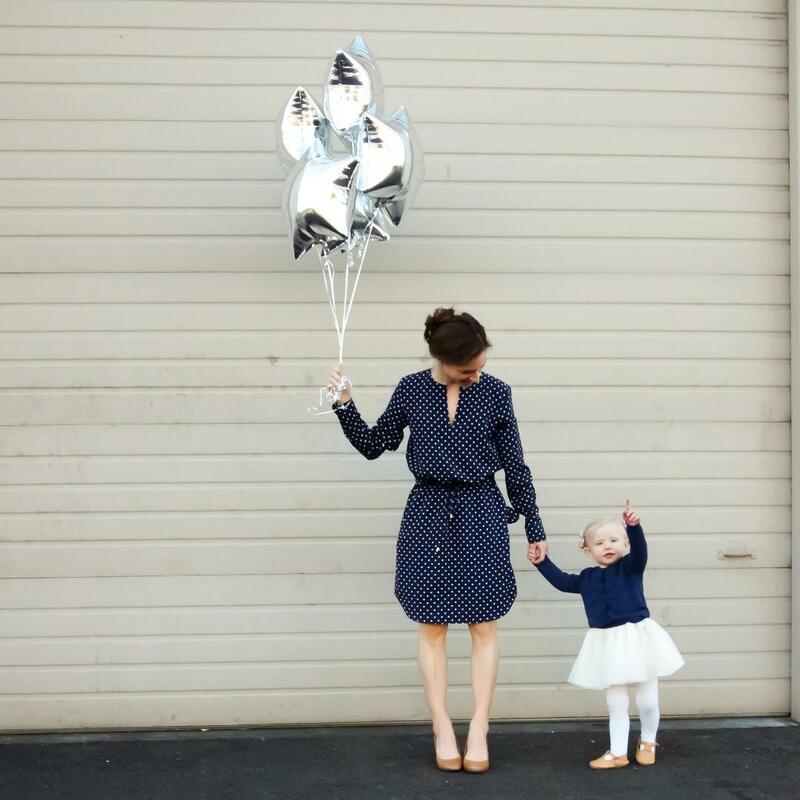 5) What is something you wish moms would talk about more often on Instagram and their blogs? For me at least it's getting in front of the camera. I want to make sure Hallie has plenty of photos of us together as she grows. Not to sound morbid, but when I am no longer here I want her to not only have memories of our time together but photos to cherish as well. I wish everyone made this a priority! 6) What are three words you AND your friends would use to describe you? I had to poll my besties to help me answer this one. We came up with: Loyal, thoughtful and creative...and I pretty much almost cried hearing them describe me, so I'll add SENSITIVE for a bonus 4th word! Thanks again Steph for letting me take over today! Be sure to head over to Happilyevermock.com today to learn more about Steph! 15 sunrises until the first official day of spring and we are all smiles over here! That feeling of a new season upon us always gives me a fresh perspective and new start. 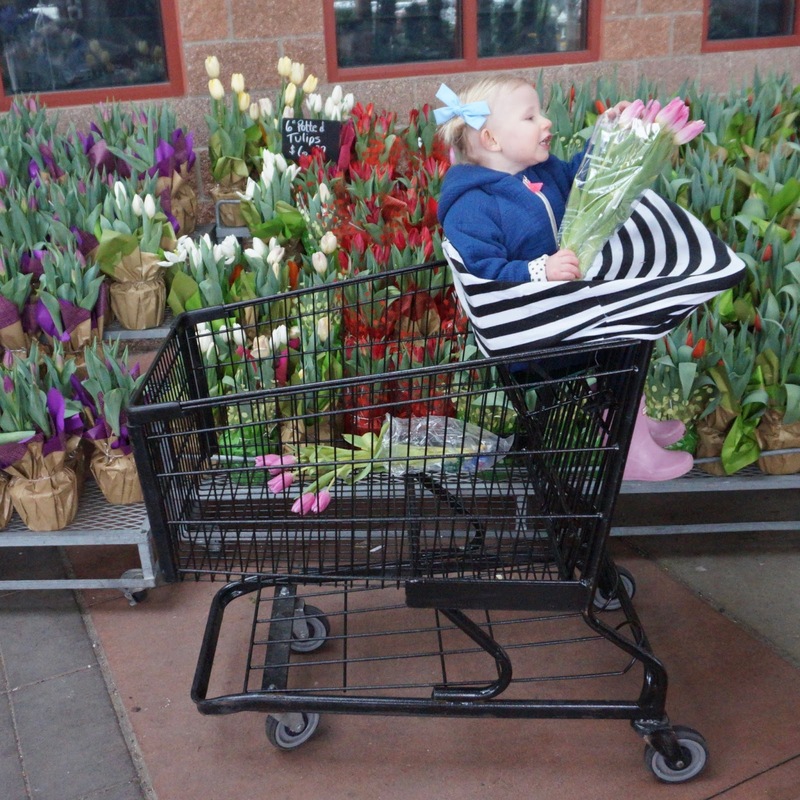 We even walked away today from our local grocery store with our first bundle of tulips. Below are a few ideas I thought I'd share on a little "In-Spring-Ration" for you and your family in the up coming weeks! Sunday March 11th is this year's Spring Forward, and we couldn't be any more excited for it! We look forward to being able to extend our evenings outside as a family with a stroll, blowing bubbles in front lawn, or sitting out on our patio furniture in the backyard. The extra light get us up and out as a family. My favorite way to end the day here in the Pacific Northwest. Opening all the windows to our home brings in that slight cool breeze and fresh air. A new start. 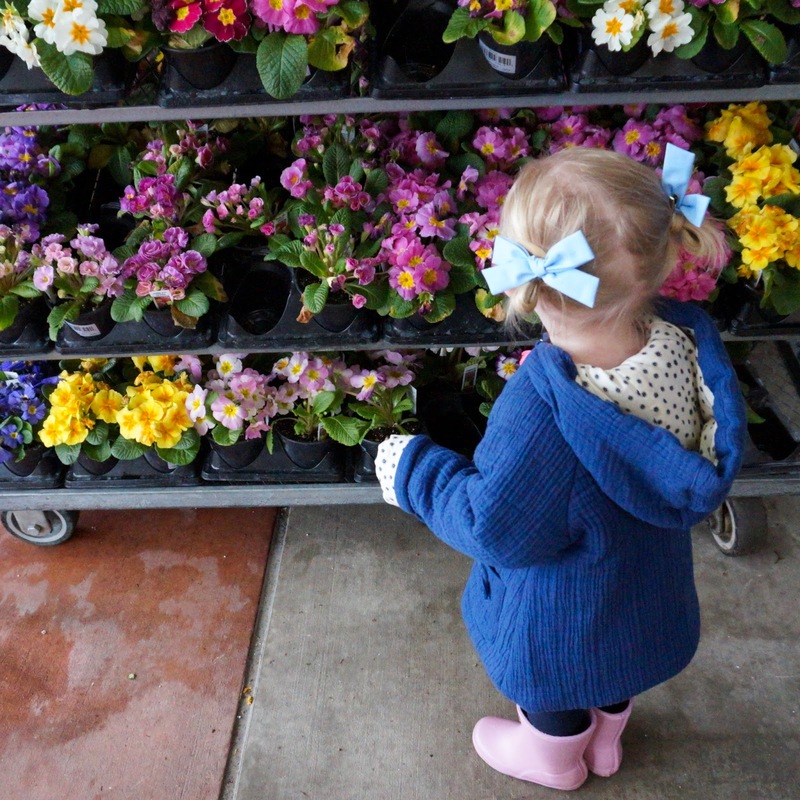 By letting the outside in and circulate within our home, we also get a jump start on spring cleaning. Would you agree less dusting always sounds like a good idea? (yeah, me too). Plus every once in awhile we can catch a glimpse of a rainbow outside our window. Have you noticed this major growing trend on Instagram lately about essential oils? I now understand why so many people are jumping on that train and why spas regularly offer them, especially the scent of lavender. After doing a bit of research, I learned lavender reduces anxiety, emotional state, improves sleep and restores skin complexion which would explain why lately we are loving the scent of lavender in our house. I can feel my entire body relax and my mood shift whenever lavender is diffused. I love diffusing peppermint in the winter, but lavender in the spring is a close second. Our local, famous tulip fields open the last week in March, right before Easter! I love getting a few fresh bundles to place on the table for Easter brunch every year and place a vase or two in both our Master bedroom and Abby's nursery. Bringing the outside in feeds my creative soul while I blog or photograph Abby playing during the day. Plus, I believe flowers make us all smile just a little more. About every 3-5 months Abby's closet needs to be rotated out, as she keeps growing out of things. I keep all of Abby's current clothing sizes, shoes, bows and accessories up front in her closet and very organized, as it helps our mornings run smoothly while getting her dressed. This weekend, we purchased organized bins, wiped down all her drawers, and boxed up most of her 12-24 months clothes. She's officially in 2Ts now! All I can say is: sad face emoji. In 3 months, she'll officially be 2 years old. You can get some fun photos with this one! It's also a great way to get your little one running and laughing (perfect for when nap time arrives), amen? If you haven't tried a bubble wand (usually $1-$2) with your baby, toddler or child I say go for it! Besides a balloon or cake pop. I get the biggest belly laughs and smiles from Abby when she's playing with bubbles. As you know from my instagram stories and feed over at mama.jots, we are major cake pop fans. I could also just say the word "cake" because we celebrate everything with a cake over here. Sometimes we celebrate just the fact that it's Friday because, Fridays are meant to be celebrated!